It's the week before April 5th. The taxes are done and filed and we'll get a refund. I've recovered from my bronchitis and hospital stay. 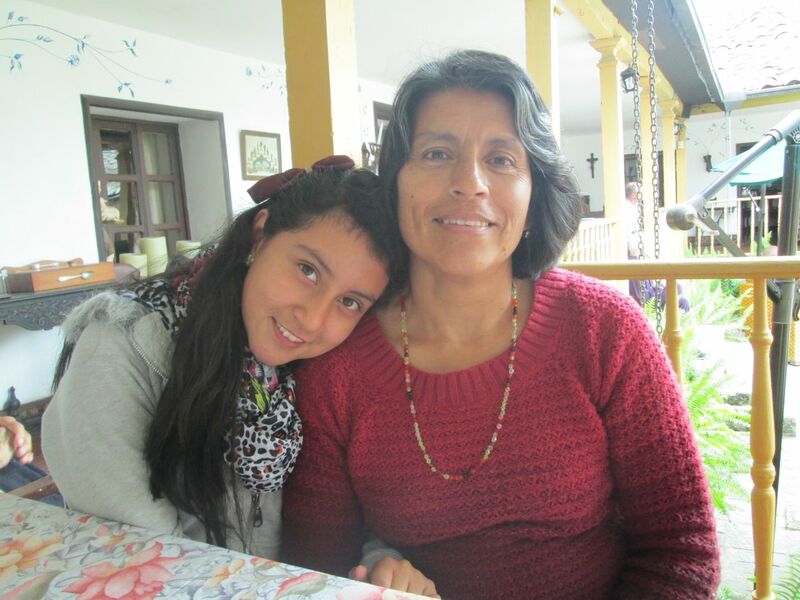 Our friend Elaine has a new OT student working with her at CRECER for eight weeks in Ibarra. Time for another excursion. But where do we go? We've wracked our brains for a new spot nearby to show Elaine, as well as explore ourselves. In desperation, Isabel calls Patricia, her sister who lives in Cayambe, to see if she has any suggestions. She not only has a suggestion, but says she'd like to go with us and guide us. We agree to meet her at her house on Saturday, April 5th. Saturday is here. Isabel and Marilyn have prepared another great picnic. Elaine and Melissa Mathew, the OT student currently working with her, arrive at our house on time at noon. 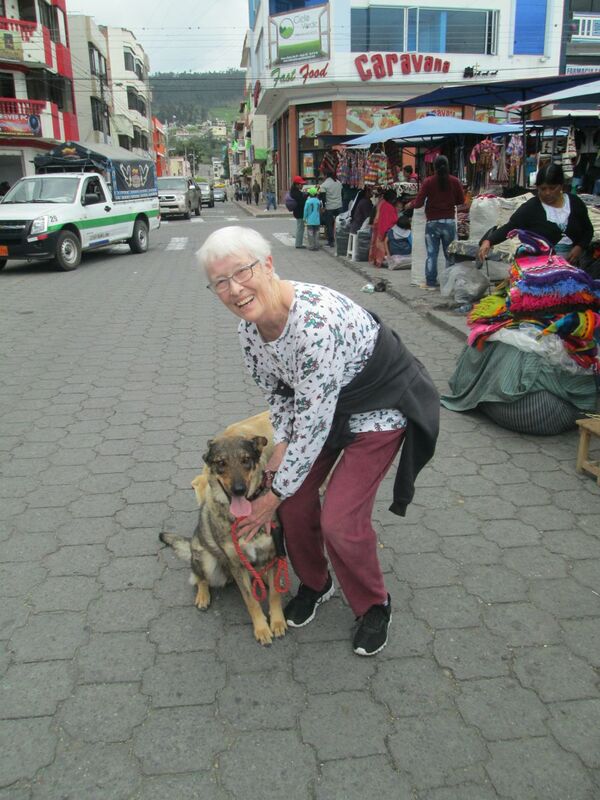 We pile into Billy Bob, say ciao to Canela yet again (poor dog), and go to pick up Brayan in downtown Otavalo after his English class. Marilyn forgets she's going to Brayan's English school and heads for his normal school. This is a significant mistake because it means we drive more than necessary in Otavalo on Saturday - a crowded market day with Quito-like traffic because of the hordes of vendors and shoppers. Oh, well. We'll get there - and likely have a good time to boot. We arrive at Patricia's house about 1:00 pm. She gets in, along with Mayra, her eldest daughter, and Sarai, Mayra's one-year-old daughter. Karen and Diego, Patricia's other children, are not coming because of a soccer game. Good thing, because twelve passenger Billy Bob is about maxed out. Patricia tells Marilyn, "A la derecha, a la derecha, a la izquierda, recto, a la derecha (Right, right, left, straight, right)," and we're soon into the country, away from the small city of Cayambe. (Of course, Patricia talks about other things between her directions.) Since she's squished between Marilyn and myself in the front of Billy Bob, it's pretty easy for us to understand her. One of the surprising things we learn is that her job takes her out into the country a lot of the time. This disabuses us of the impression that she works in an office in Cayambe. She loves her job, she says, because she loves nature. Though we've known Patricia and her offspring since moving into the house with Isabel and family three years ago, this is the first chance we've had to go on an excursion with her. So far, it's fun. True, we're on a very dusty dirt road, but that's better than being on a very muddy dirt road, which I half expected because it has rained considerably recently. I still don't trust the weather. Cayambe Volcano is nearly always shrouded in clouds, and today is no exception. It's also very green here. Some of the fields are green due to irrigation, but the green trees are definitely not irrigated. To me, that greenness equals lots of rain. 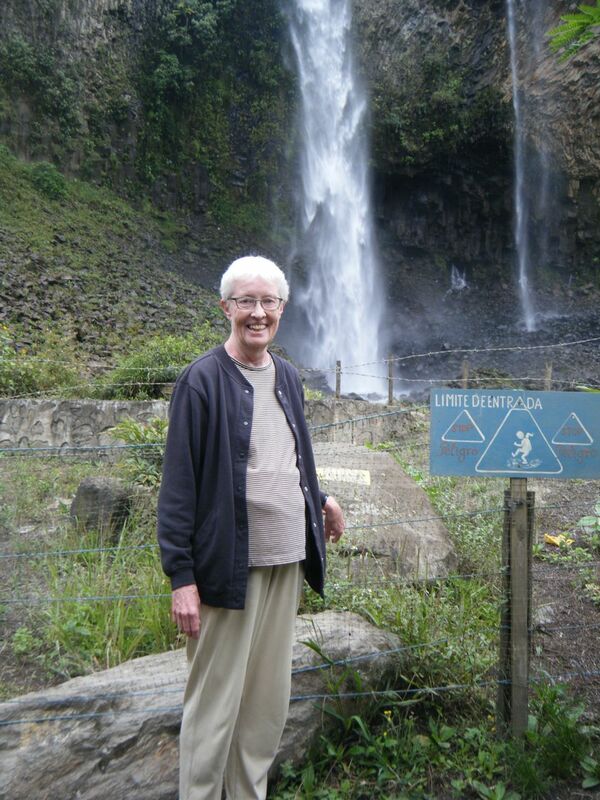 Patricia chose Cascada Cariacu as our destination. We had never heard of this waterfall, but it's surprisingly well marked - except for the last turn. Here, the sign is on the ground and could be pointing to either of two roads. We follow our noses, go through a gully, go up a hill (avoiding a party on horseback), and we're there. Not at the waterfall, but at the parking lot for the cascada. It's about 2:00 pm, so naturally we eat our picnic lunch before the intrepid hikers strike out for the waterfall. We have red beans and rice, carrot and raisin salad, a kind of cole slaw, and peach or mango juice. Because we have two insulated chests, the warm things stay warm and the cool things stay cool. It's not a bad system. I watch the hikers as they go up a gentle hill and disappear on the other side. Then I turn my attention to the fields in front of me. Most are green, but one is golden and is being harvested. Nearby the field being harvested, another field is being plowed. The contrast strikes me. I'm not sure if I've seen anything like that in the U.S., except maybe in the cane fields of Louisiana. I don't really remember. But we're on the equator here. The weather is pretty much the same year-round, except for the rainy seasons. 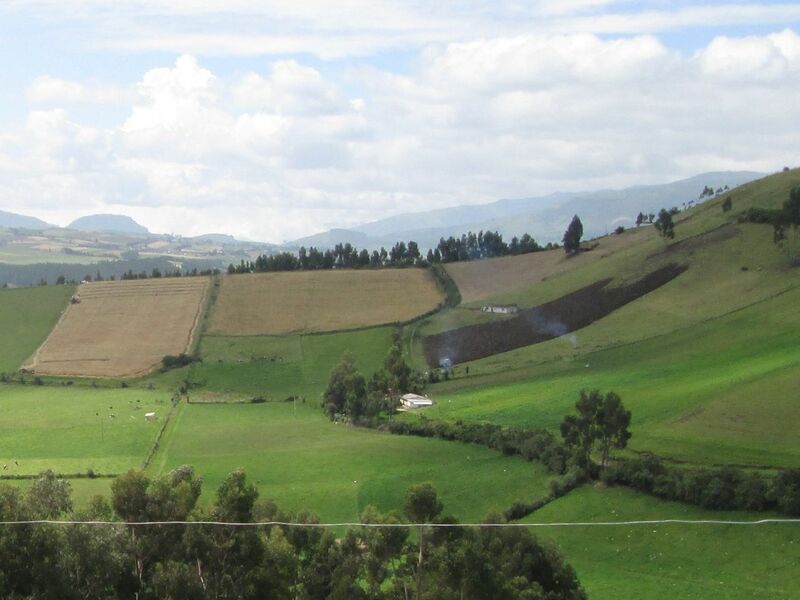 Thus, though a particular crop may have a specific growing season, the combination of available crops means that there is really no dormant season in Ecuador. 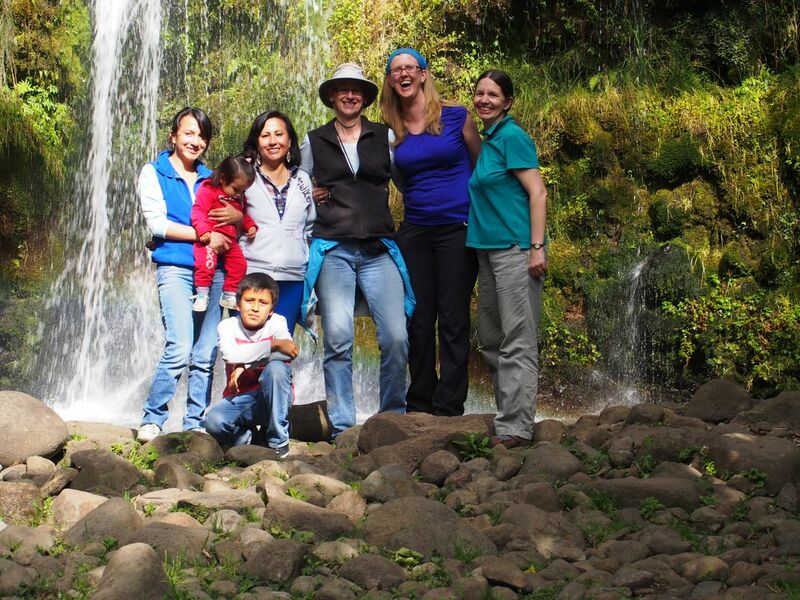 Marilyn speaking here: The hikers consist of Patricia, Mayra (carrying Sarai), Brayan, Elaine, Melissa, and Marilyn. 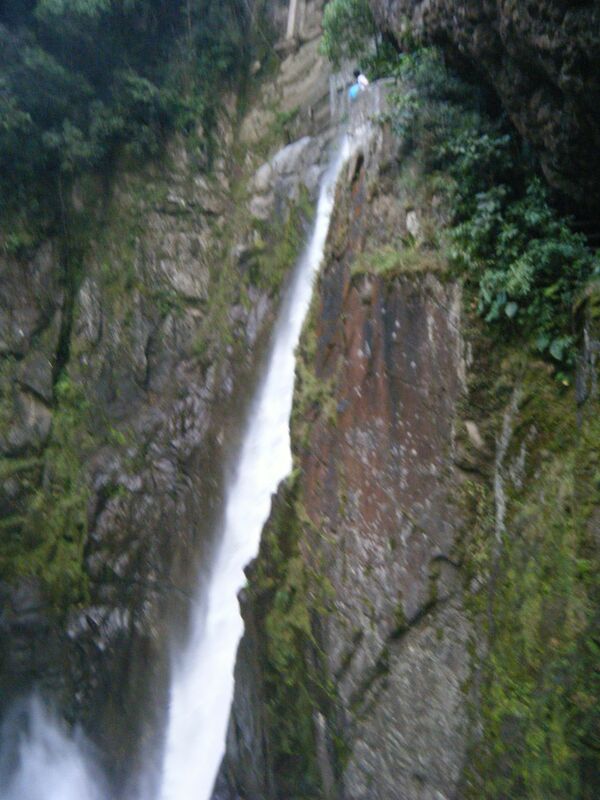 The cascada is not just a cascada, but a series of cascadas. We are getting to see two parts of it. As we cut off of the dirt road which has rapidly deteriorated after the parking lot, the trail heads down along the hillside. We are shaded because of the low forest on either side. 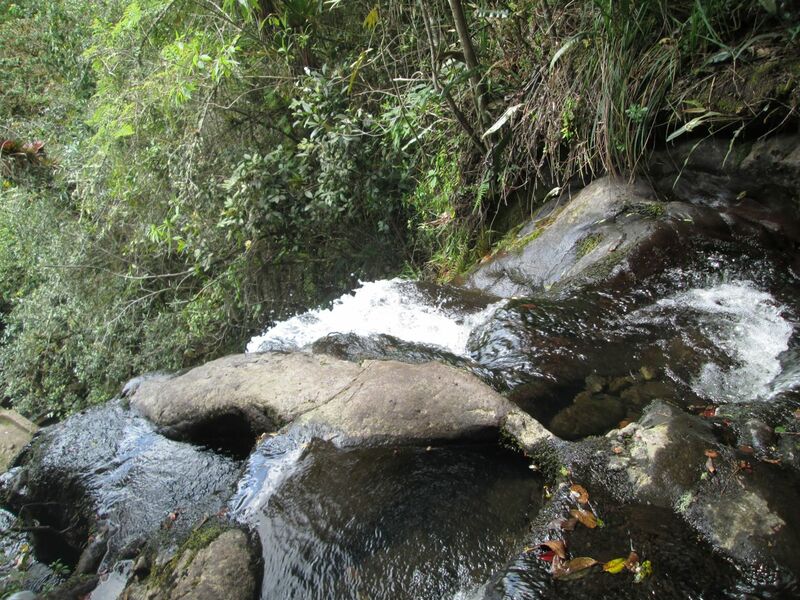 The trail takes us to a cut-off where we walk to, above the higher of the two waterfalls we see today. 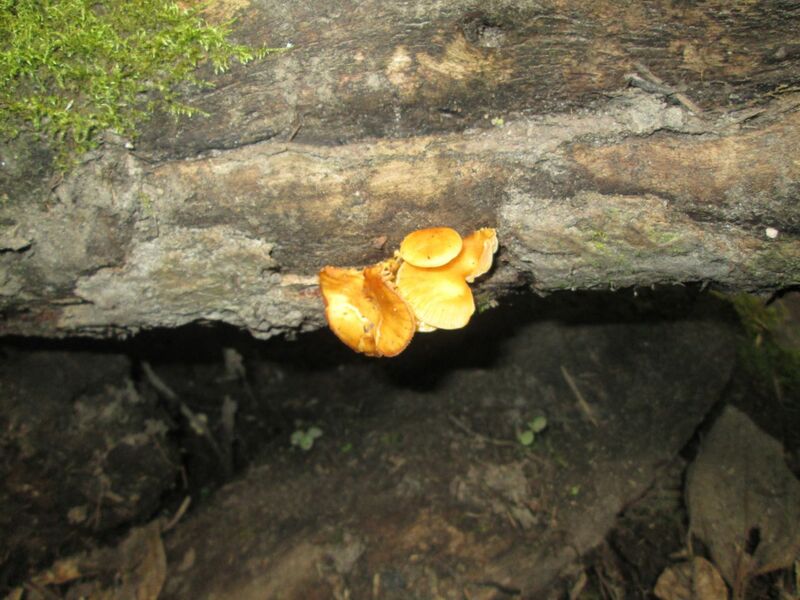 It’s a rough trail and in a few places we hold on to branches as we move down. The stream is clear, running over many rocks, winding quickly then suddenly plunging below. The area is beautiful and we are surrounded by vegetation while hearing the moving water. We ascend again to the main trail which takes us to a second waterfall. This involves two stream crossings. Sarai is gingerly passed across between willing hands that fear someone might slip on the rocks. 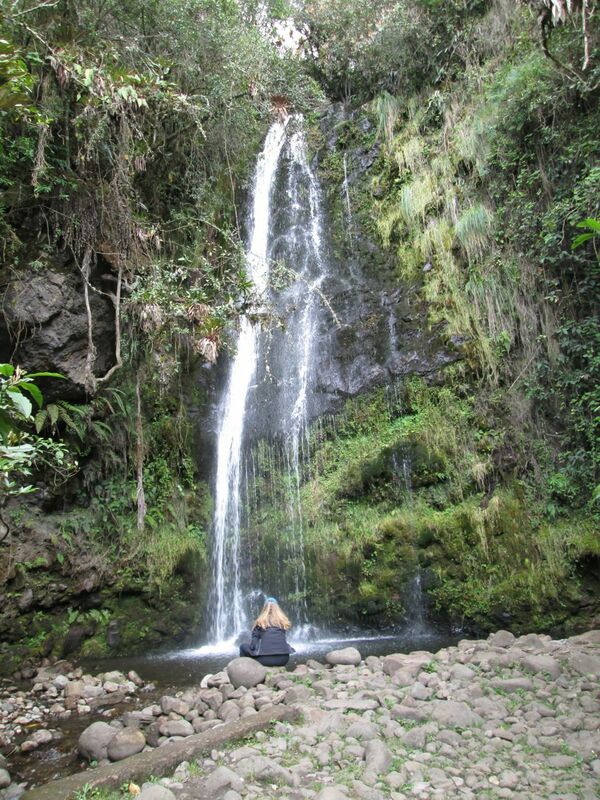 When we arrive at the bottom of the waterfall, what a lovely view we see. Pictures are taken and some of us sit and just watch the water descend. After awhile, we head back down the trail, again crossing the stream twice. After passing our first cut-off, we take another short trail down to the bottom of the waterfall of the one where we first watched the water disappear over the edge. This is a much higher drop. 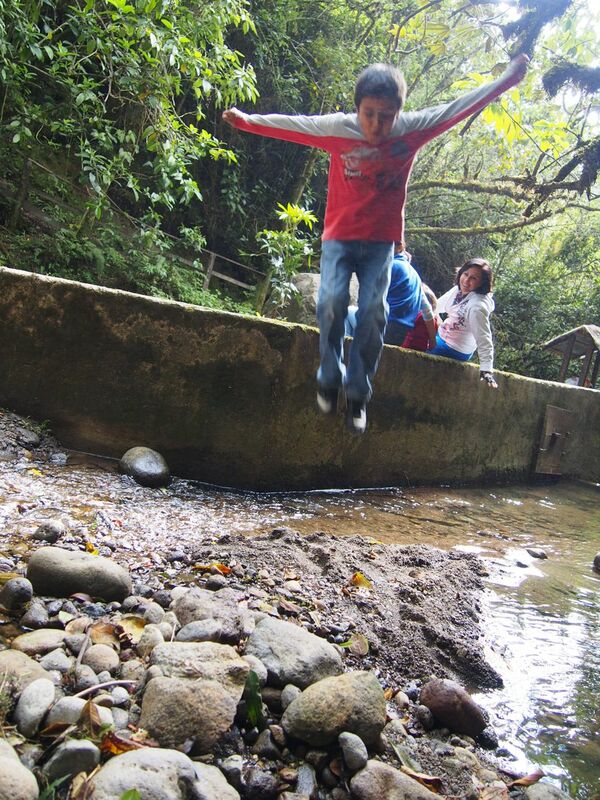 Brayan entertains himself by repeatedly jumping off a short ledge. The rest of us take in the beauty of the protected scene. It’s good to see such beautiful places God has created. After awhile, we head back up to the car, all of us refreshed from the exertion, the sound of the stream, the beauty of it all. The field being plowed is on a pretty steep slope. The tractor only plows when going downhill. I imagine it is not powerful enough to plow uphill. It plows a swath going downhill, lifts its plowing discs, chugs uphill, positions itself, lowers the plowing discs, and plows another swath downhill. It's probably inefficient but necessary. I do wonder why they don't plow across the hill rather than up and down. Seems like that would cut down on erosion, especially on a steep hill. Maybe it doesn't rain here as much as I think and erosion is not much of a problem. 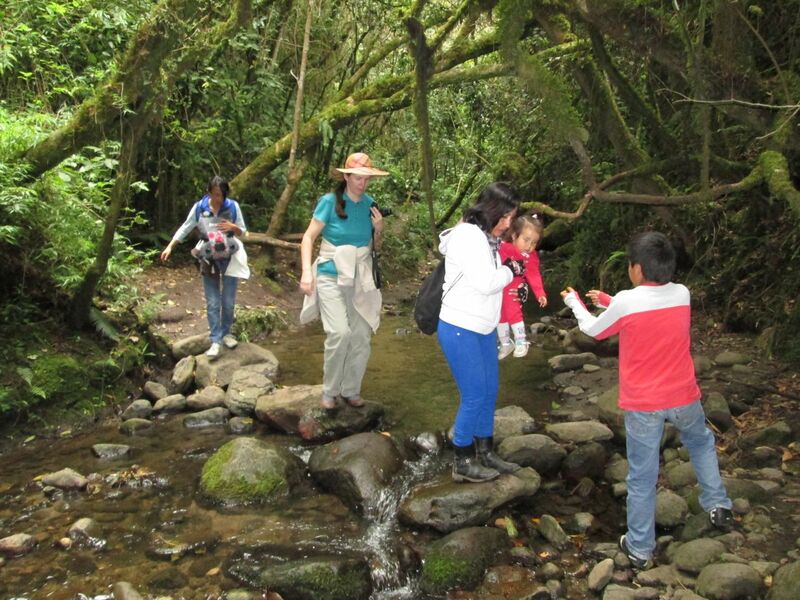 Ecuador does have a gazillion microclimates. Meanwhile, the harvester in the golden colored field is making perfectly straight lines perpendicular to my vantage point. After awhile, it stops and doesn't start up again for a very long time. It's so long, in fact, that, with the heat and good food I've eaten, I fall asleep. When I wake up, the harvester is moving again. But I notice something strange. The lines are not perfectly straight anymore. They're actually pretty crooked, especially compared to the lines that were made before I fell asleep. I can't help wondering what the driver had for lunch! Well-fermented chicha? I also notice that Isabel and Victoria are gone. I spot them on the road, up the hill. Isabel is taking her for a short walk and I'm glad. It can't be much fun for Victoria when we take these nature excursions. Like me, she can't get around and enjoy many of the destinations that are the objects of these excursions. Also, unlike me, she's no longer able to find alternatives to occupy her time. It makes it hard on Isabel because Victoria expects Isabel to entertain her. Shortly after Isabel and Victoria return, I see the bedraggled hikers cresting the hill. Now that it's all downhill, Brayan spurts ahead, of course. Mayra is carrying Sarai and they're not far behind. Now the rest are here and I'm treated to pictures and excited descriptions. 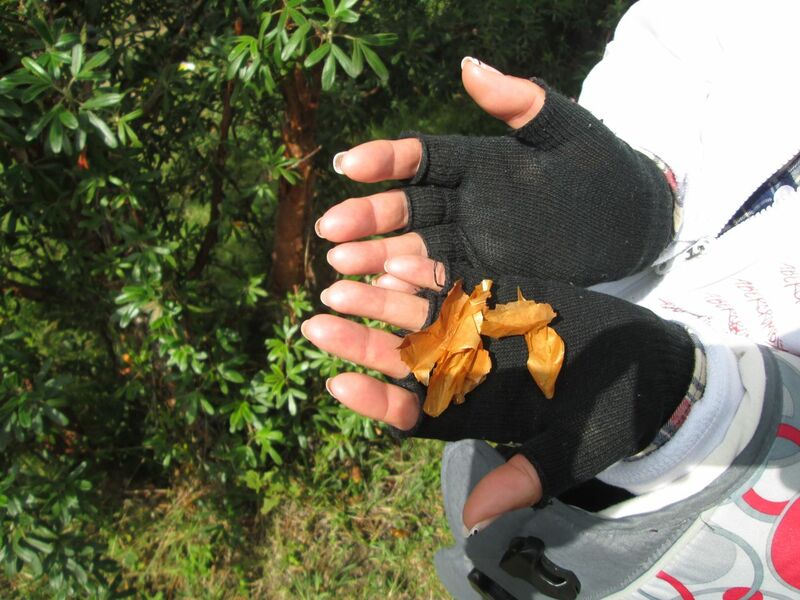 Patricia is also showing me a peeling of bark from a tree called Yagual (known as Arból de Papel or Paper Tree). She is saying that people used to use this for paper. Many of our party are going to the bathroom before we leave. Yes, somewhat surprisingly, there is a bathroom here with an enclosed toilet. I say surprisingly because the only people we saw on this sunny Saturday afternoon were a group of four on horseback and a group of five at the cascada. That indicates to me that not many people come. So much the better for us. It's nice being alone in a natural setting. Everyone is in Billy Bob, we're heading down the hill, into the gully, out of - oops. There's too much weight in Billy Bob to get out of the gully going in this direction. Five people get out of Billy Bob and Marilyn tries again. Success! People get back in and off we go. 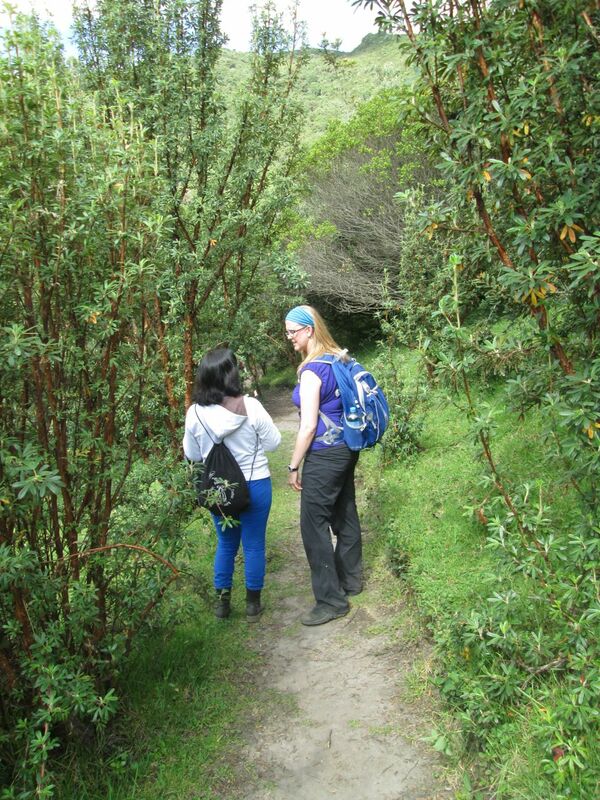 Instead of going back the way we came, Patricia directs us on a different route back to Cayambe. We are out of the foothills of the volcano and find ourselves in a rolling valley of quite colorful fields. We see some rose plantations along the way, and also one or two calla lily plantations. 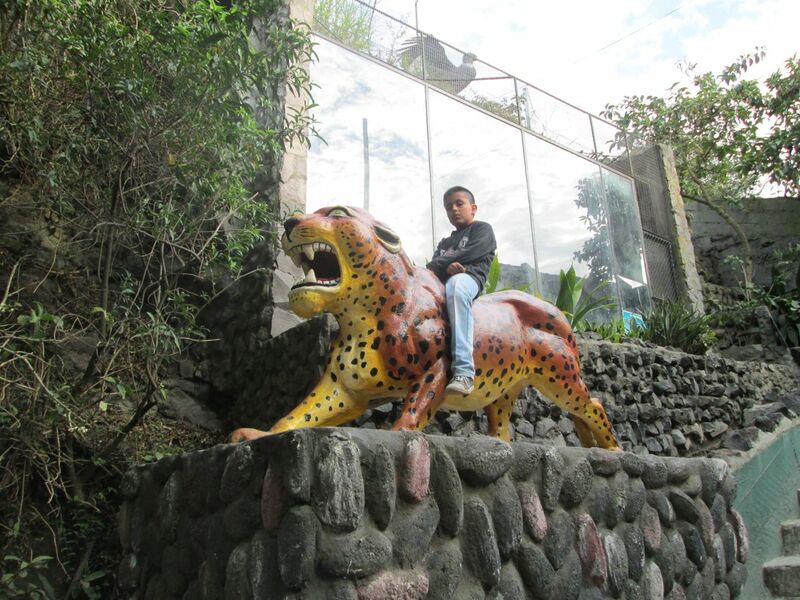 We're back in the city of Cayambe now and Brayan wants to go to the family park. There is some really neat playground equipment. Even the adults enjoy it. However, I shudder to think of the lawsuits this equipment would prompt in the U.S. Indeed, I see kids take a tumble, sometimes a pretty drastic tumble, every once in a while. They get up, rarely cry, and go right back to playing. The parents are definitely not overprotective, as for as I can see. We drop Patricia, Mayra, and Sarai at Patricia's house. Patricia says she has some other places near Cayambe to show us. We're game - and excited. Our first excursion with Patricia may have taken three years to come about, but it looks like there will be more in our near future. I love posts like this that paint vivid pictures with words. Sunday was a tough. It was the day after the last mission group affiliated with Bridging Cultures left. 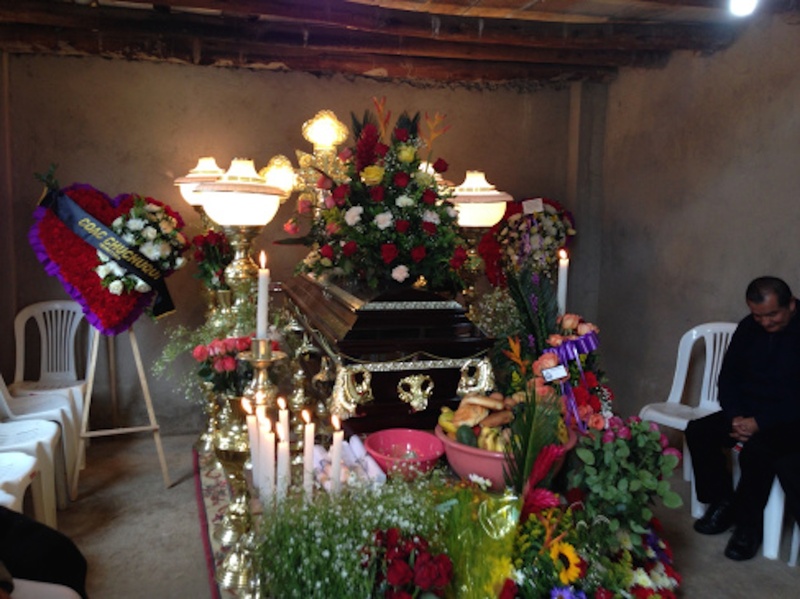 What made it difficult was that Sebastian Caiza's father had died the day before, so the funeral began on Sunday. Sebastian is a board member of FEDICE. Marilyn had to go by herself because I was coughing so loudly and often that I was afraid I would disturb people. Marilyn was to meet Blanca, Luis, and Lisa there, so she would have more friends than Sebastian and his wife to talk with. 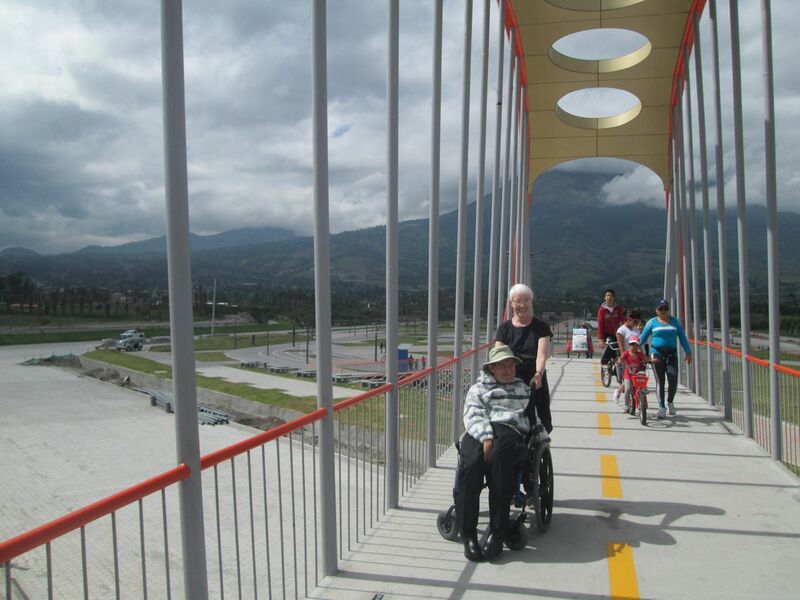 The previous night, Blanca et al, had picked up Tania Curiel and Hector Curiel at the Quito airport. They brought them along to the funeral to experience more of Ecuador while the FEDICE team members paid their respects to Sebastian. Tania is Hector's daughter. A few months ago Tania had casually entered a contest sponsored by National Geographic to name a species of fish which had been newly discovered off the coast of Chile. Two or three months later she was surprised and delighted to hear that her suggested name of El Chilito had been chosen. Read all about it on Tania's blog, El Chilito. 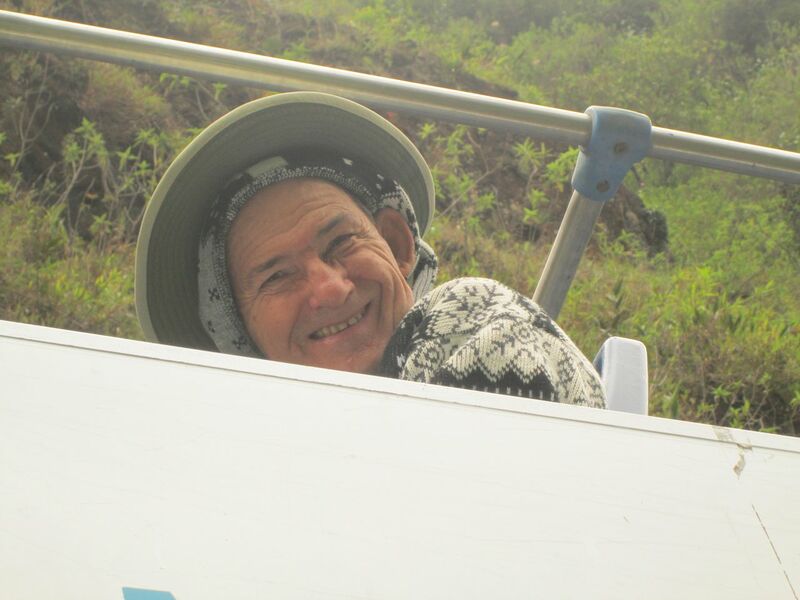 The prize was a ten day trip for two to the Galapagos Islands. "Okay," you're probably saying, "that explains why they were in Ecuador. But why would they hook up with FEDICE?" (I'm so glad you asked that question because it allows me to hone my explanation abilities.) Hector Curiel, Tania's father, is actually Reverend Hector Curiel, pastor of an Hispanic Christian Church (Disciples of Christ) congregation in Portland, OR. That's still a somewhat tenuous link to FEDICE, you say? How about this? The Disciples Church's area ministry in Oregon has supported FEDICE for ten years or more. Still not enough? Hector and Tania's church has a ministry on the Mexican side of the U.S. - Mexico border and are always seeking ways to improve it. Since Tania and Hector would be in Ecuador anyhow, and they knew of the work of FEDICE, why not spend a few extra days and pick FEDICE's collective brains about how that work is performed? 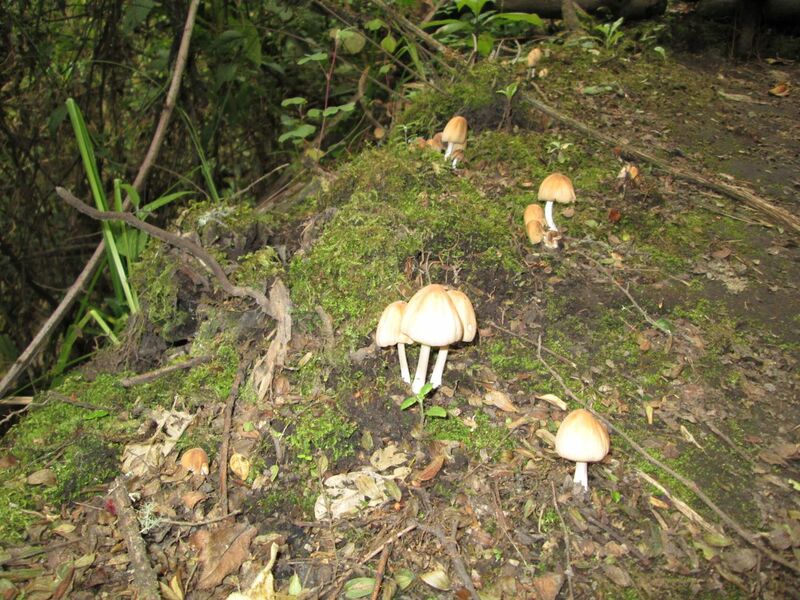 Tania gives a good description of the funeral (what many might call a wake) on her blog. And she writes well. I recommend reading it. Blanca always packs as much into a trip as possible. 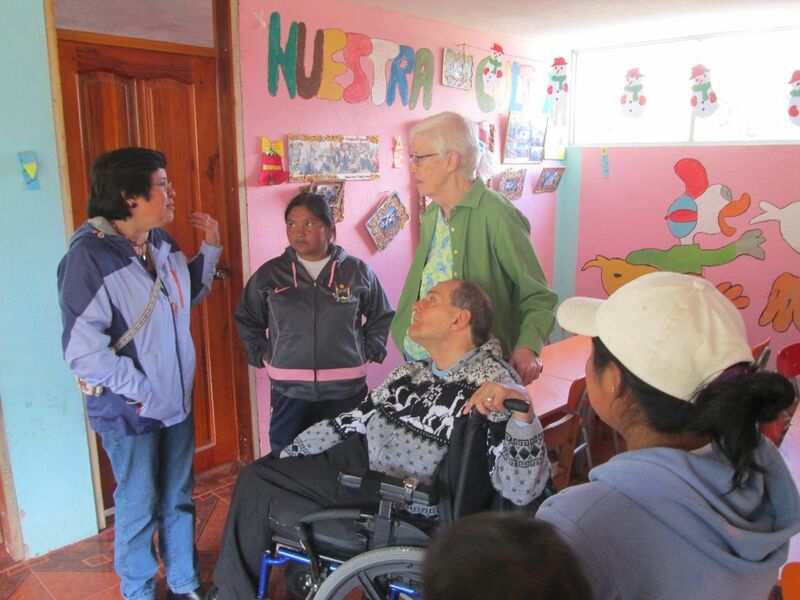 Therefore, since they were in the Otavalo area, Blanca asked Marilyn to help guide Hector and Tania on a tour of one of the preschools where she teaches. 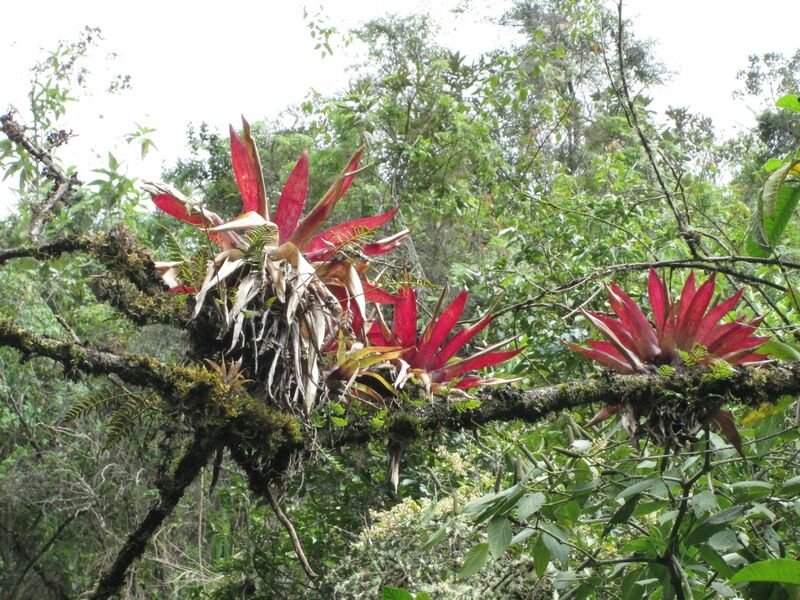 This one is located in Caluquí Alto. 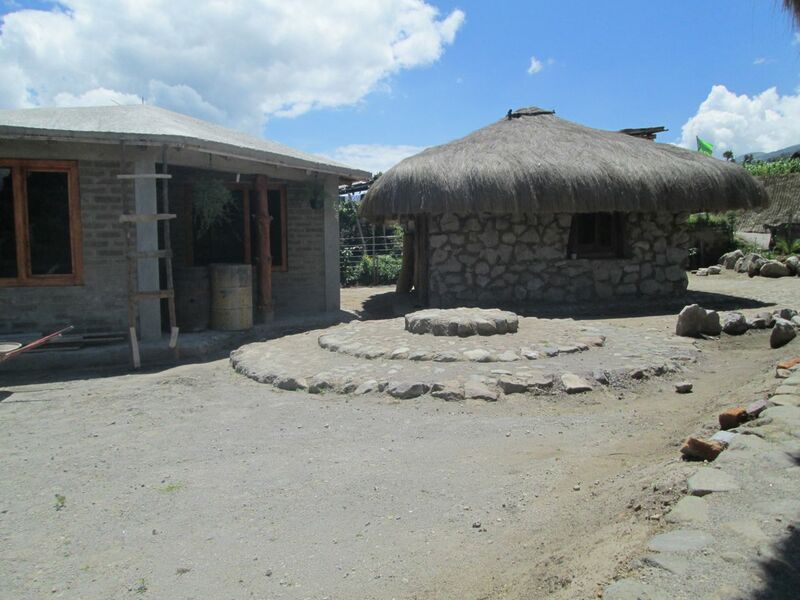 It is named after Violet Vaca, a co-founder of FEDICE, because FEDICE has long supported and expanded this pre-school. Violet recognized early on that mothers working in the nearby rose plantations needed a safe place for their children to be taught and cared for while they worked. The group met Luzmila and were shown around. It was late afternoon when they finished, so Marilyn invited everyone, including Luzmila to our house for café. We had a wonderful time talking to these lovely folks. We explained what we did for FEDICE and in turn heard about their ministry. The group (minus Marilyn) went back to Quito that night and Hector and Tania stayed with Blanca and Luis. The next day Tania and Hector were shown around FEDICE's offices and given a presentation of FEDICE's work and operating procedures. 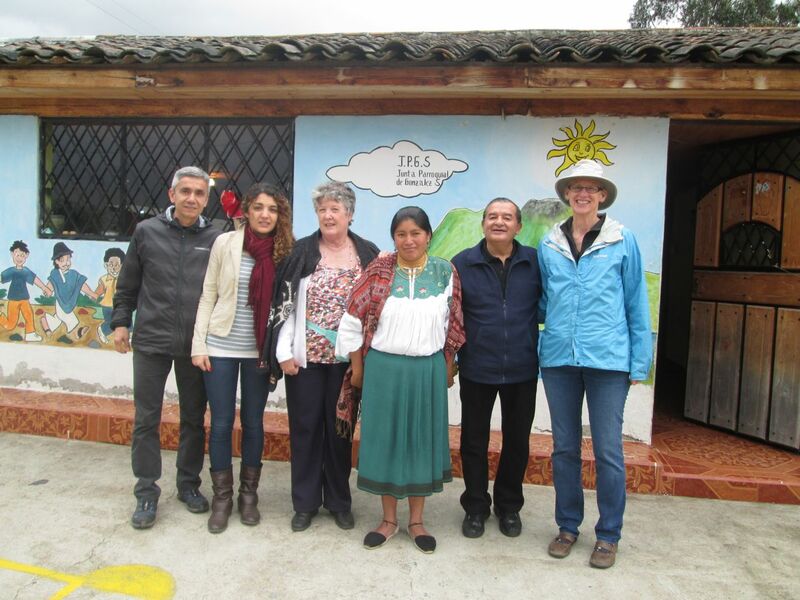 Then they spent two and a half days in Cotopaxi Province visiting and learning about the agricultural and animal husbandry projects that FEDICE supports, as well as another preschool which has been helped by FEDICE. Again, more details can be found on El Chilito. 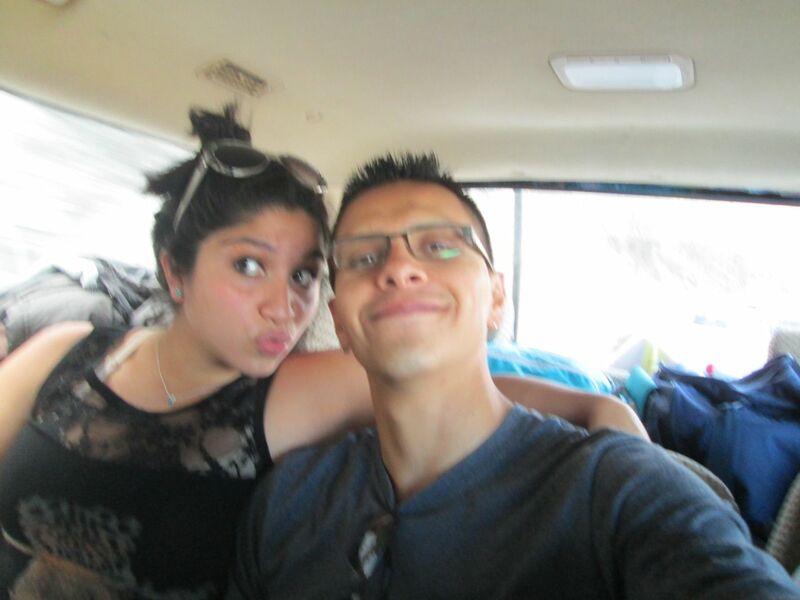 On Thursday, Tania and Hector flew to Guayaquil, Ecuador, for their adventurous cruise to the Galapagos Islands. Judging from Tania's Facebook page, it looks like they had a fabulous time. 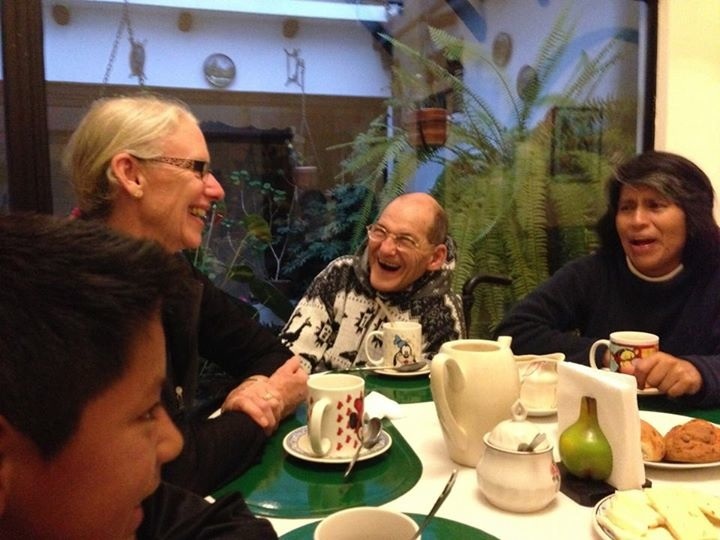 The first person to TWICE visit us in Otavalo waaas - PAT BILLINGS!!! Unfortunately, the only prize Pat received for that distinction was good hospitality - we think, and hope, and pray. We did some of the things we had done with her the first time around, at her request. But we also did some different things. We have lived in Ecuador another year and a half since Pat's first visit, and our appetite for exploration has not decreased during that time. So we had new experiences and new beautiful places to offer. On Pat's first full day here, we didn't make her get up too early. 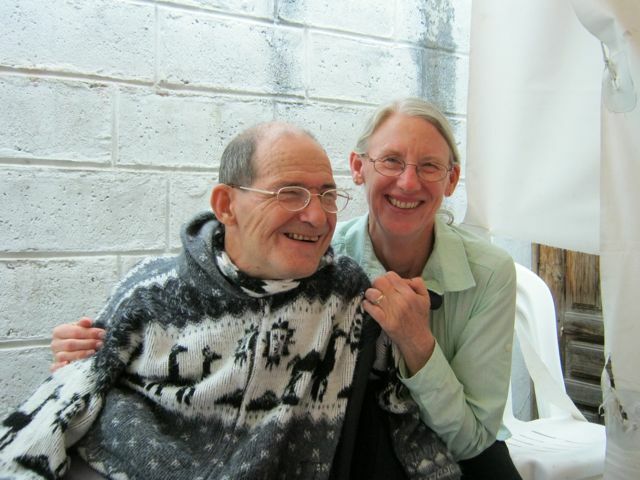 After all, by the time we met her at the Quito airport the night before, drove to Otavalo, and gabbed around the kitchen table, it was well past 2:00 am. But we did get up in time to walk to the mercado before lunch. We took Canela with us and Pat tried to give her a little training. I think our stubborn pet ended up training Pat. For lunch, we took her to one of our favorite restaurants. La Estelita is perched high above the city of Ibarra, thirty minutes away. 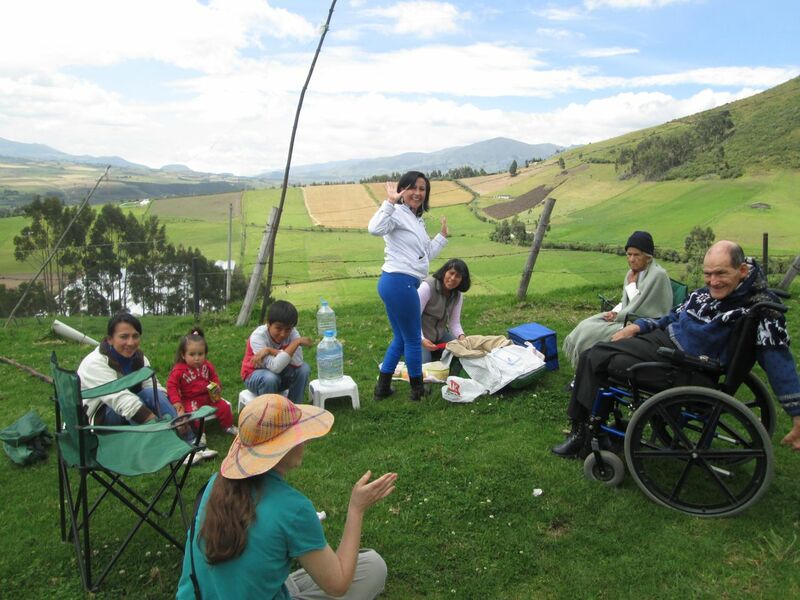 I've written before about the spectacular view of Ibarra and Imbabura Volcano it affords. The food is top-notch, too, which is why we keep going back. The accompanying picture doesn't show the view. For that, please click on the name. I doubt that you'll be disappointed. The next day we went to Pijal Centro, a mostly indigenous community about 30 minutes south of our home. Blanca, the Executive Director of FEDICE, met us there. Over the years that Marilyn and I have volunteered with FEDICE, Pat has made more than one donation. 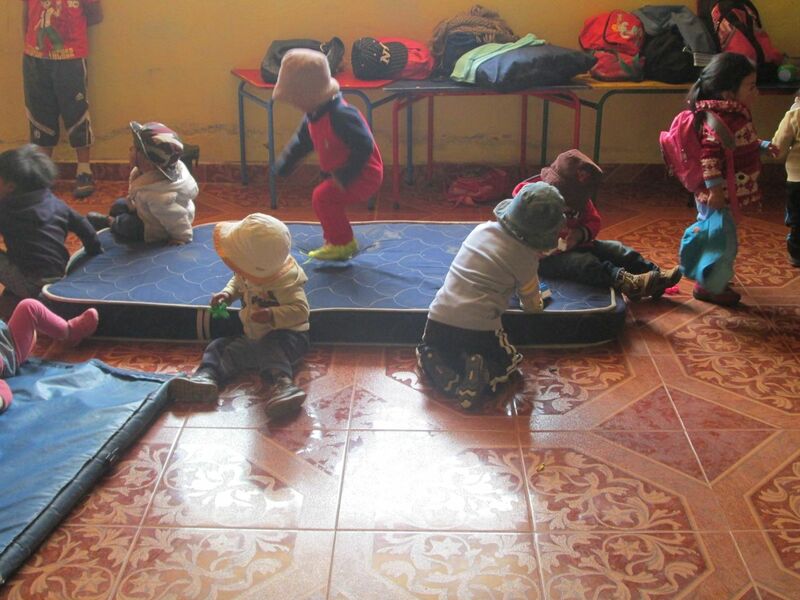 Blanca wanted to show her the preschool where her last donation was put to good use. Sebastian Caiza, president of FEDICE's Board of Directors, was also there to express his gratitude. From there, we stopped to pick up another friend named Blanca and part of her family. We were all going to see a project in Sebastian's hometown of Tocagón. 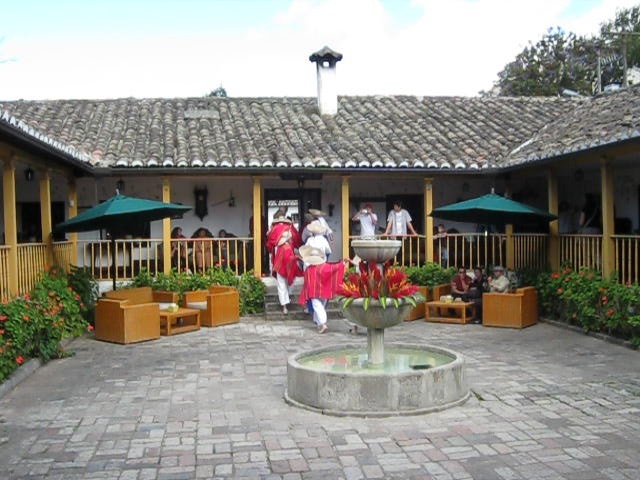 This is a small museum known as The Monolito. Several years ago there was a gigantic rainstorm in the area near Tocagón. It was heavy enough to send boulders crashing down the mountainsides. Some of these boulders were found to have archaeological significance after being studied by a professor at the University of Otavalo. "Hey," the people of Tocagón said, "we need to preserve these for our culture." 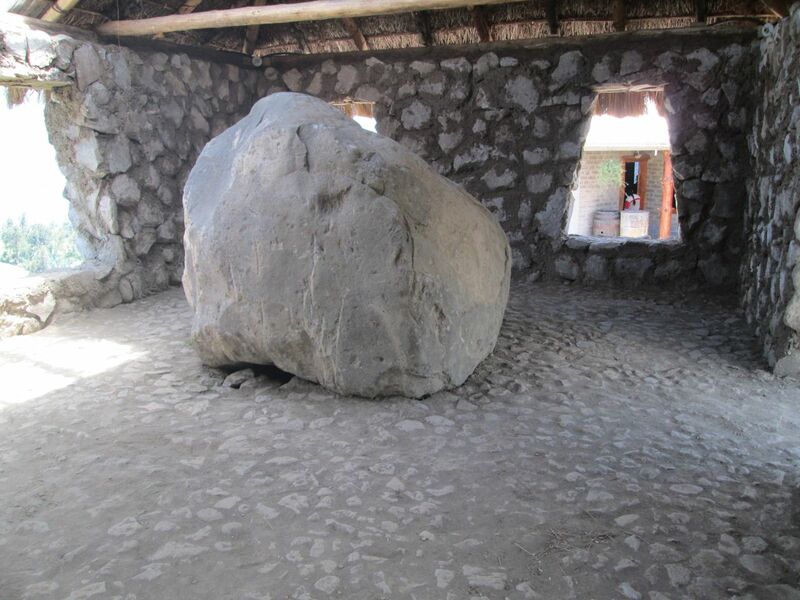 They also realized they could build a small museum with these boulders as centerpieces and attract some of the tourists who visit the area. The largest boulder is called the monolito (the monolith). It has designs on it, but it's not known what exactly these designs mean. Another boulder has depressions and humps. It is thought to be a general map of the area, indicating landmarks such as Lago San Pablo, Imbabura Volcano, and Fuya Fuya Volcano. 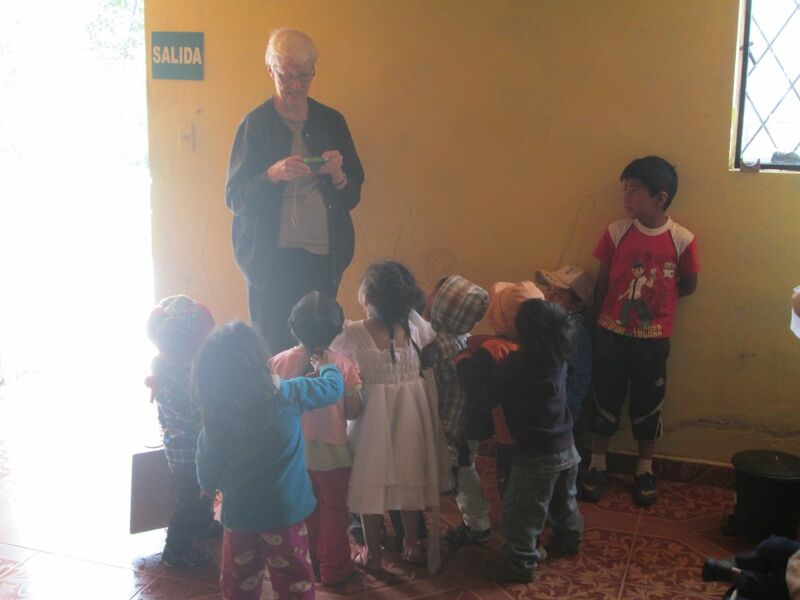 On Friday, February 7, Marilyn had a chance to take Pat to another of the preschools where she teaches English - Caluquí Alto. Marilyn has taught at this pre-school the longest and it was here that she developed an interesting program. Just as at Pijal Centro the day before, Pat had a great time interacting with the children. 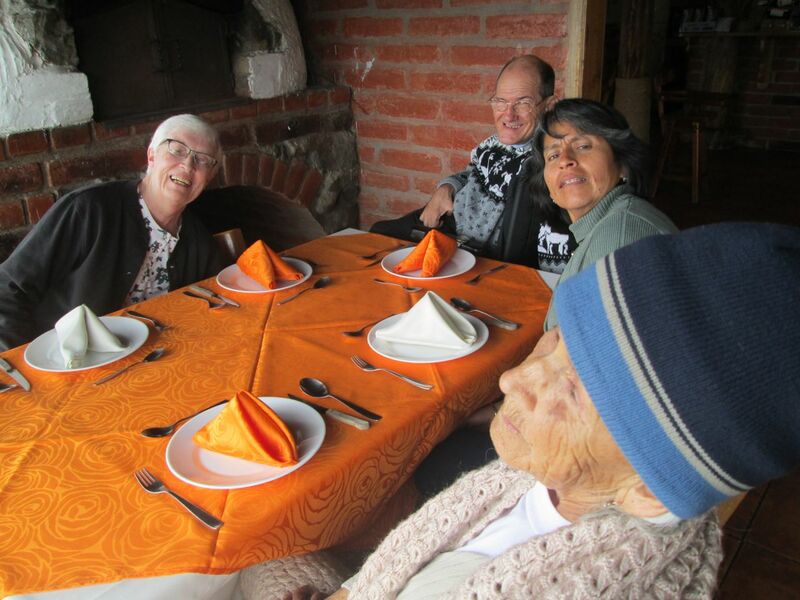 After that, we ate lunch at Punto Y Coma, the restaurant in Otavalo run by Luz (Isabel's sister-in-law) and Cesar (Isabel's brother). Cesar and Luz don't often let us, or our friends, pay when we eat there. Therefore, we told them ahead of time that we wouldn't eat there unless they allowed us to pay. (When they only charge $2.50 for a substantial lunch, we feel like we're cutting into their profits when we eat free.) They agreed, but still wouldn't let us pay for everything. They're good and generous people. 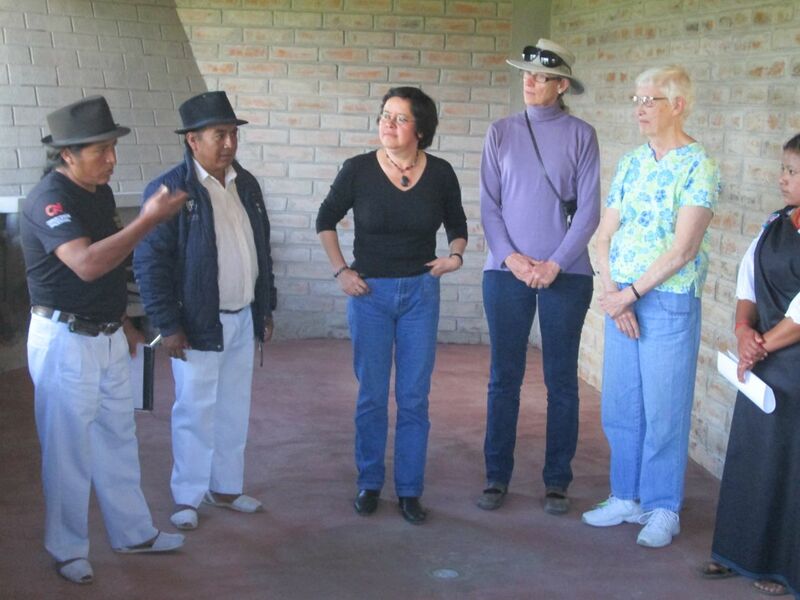 Having eaten, it was time to go to an archaeological/cultural museum in Ibarra. This has been a favorite attraction for us since we were first told about it by Karen Stothert, a friend in San Antonio, Texas. 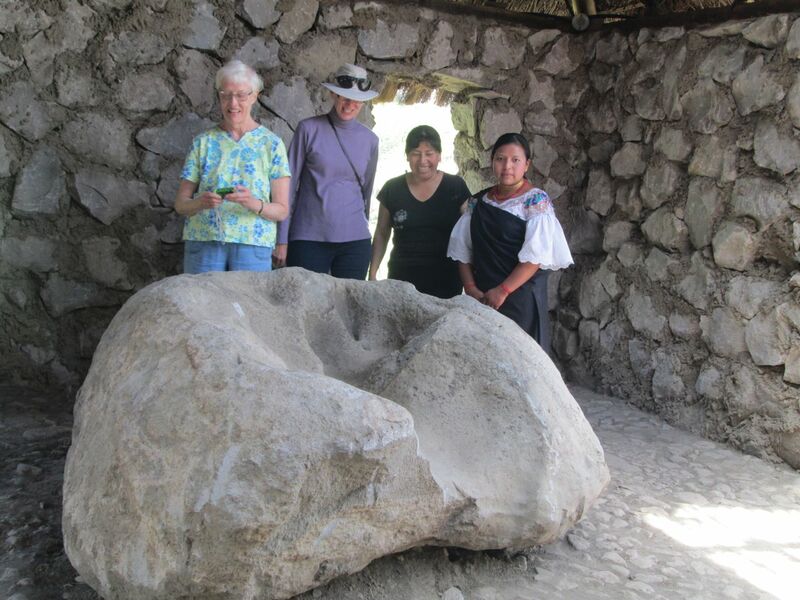 Karen is an archaeologist and has worked in Ecuador part time for the last 40 years or so. In fact, she was a consultant when this museum was set up. Besides a great archaeological section (where I learn something new every time I visit), there is a section on religious art, and a section on historical costumes. This last section is in the basement, so I've never seen it. The museum is government run and is free. 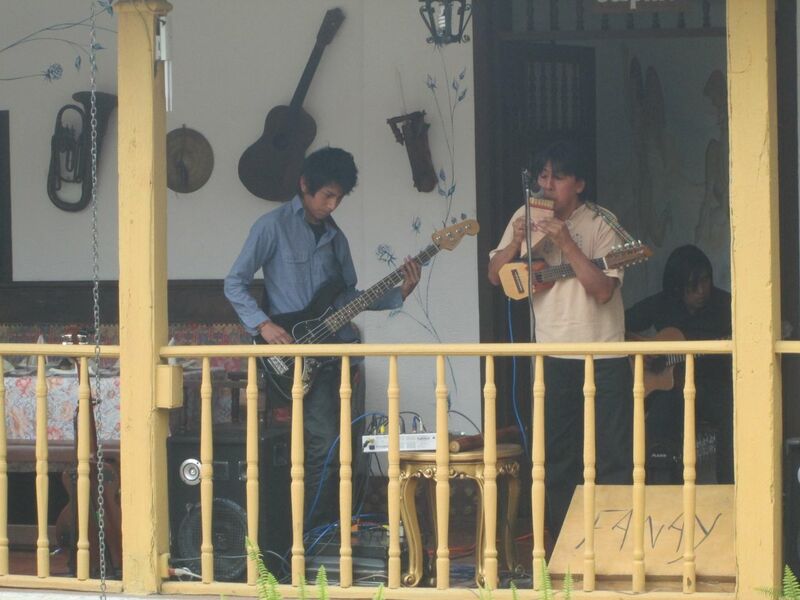 If you've read this blog regularly, and noticed that we were in Ibarra, you can guess where we went next. Yes, it was the place to which all roads in Ibarra lead - Rosalie Suarez. The helado de paila (ice cream made in a copper pan) is incomparable. Pat had been to Rosalie Suarez on her previous trip and was eager to go back. We were eager to oblige. When we had gotten into the car to go to the airport to meet Pat, we had discovered that one of our headlights was out. Besides that, the instrument panel would not light up. It was too late to try to have it fixed so we just went on. We see many cars in Ecuador driving with only one headlight. Besides, there wouldn't be much traffic at 9:30 pm at night and both brights worked. We had traveled this particular highway many times, so Marilyn could gauge her speed correctly without having to see the speedometer. No problem, right? Wrong. A policeman stopped us as we were leaving Otavalo. He appeared ready to give us a ticket. But Marilyn and Isabel explained that we had just discovered the problem and would have it fixed the next day. He let us go. I couldn't believe we got stopped the first time we noticed the dark headlight. Like I said, we see many one-headlight cars and are careful to watch for them. 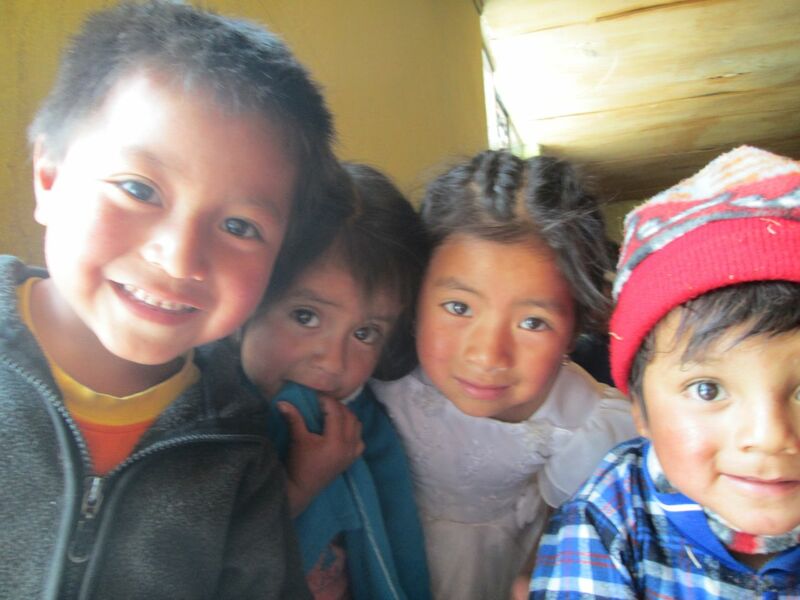 Saturday morning was the first day we could get an appointment to have the electrical system checked in Ibarra. Until then, we restricted our driving to daylight hours. While the car was being fixed, the three of us walked over to the new park in Ibarra. It is a converted airport that was no longer useful. For this reason, it is very long. Two or three new streets have been cut across it. This could have been a problem, but the park planners had the foresight to build attractive pedestrian bridges across the streets. It was very pleasant walking in the park even though it's mostly concrete and the new trees are still short, because the day hadn't heated up yet. Ibarra can get hot. When the car was ready (it was a fuse), we met Isabel, Victoria, and Maria Augusta (Isabel's niece) for lunch at the Hacienda Chorlavi. This wasn't nearly as inexpensive as eating at Punto Y Coma the day before. But we go there for other reasons besides the good food. During lunch on Saturdays, they have very good traditional music and dance. We figured that Pat would enjoy hearing and seeing it, especially since she danced in a folk dance group with Marilyn in the dark ages. After we got to Ambato, 30 or 40 km from Baños, we started getting really excited because we could see Tungurahua emitting steam in the distance. The closer we got to Baños, the better our views became because it was a pretty clear day. We (or maybe just I) hoped to see fire at night, but that didn't happen. Even if it had been in full eruption, we would have had to get in the car and drive outside of town to see the summit. Another thing I kind of expected was to hear booming in the night because we had talked to some tourists last year who had had that experience while in Baños when Tungurahua was active. Isabel and Yolanda claimed they heard some, but the rest of us slept too soundly. We wouldn't make very good "volcano alarms". Because Gaby and Elvis had to take a bus back to Quito that night for work the next day, we went straight to a popular waterfall east of Baños. 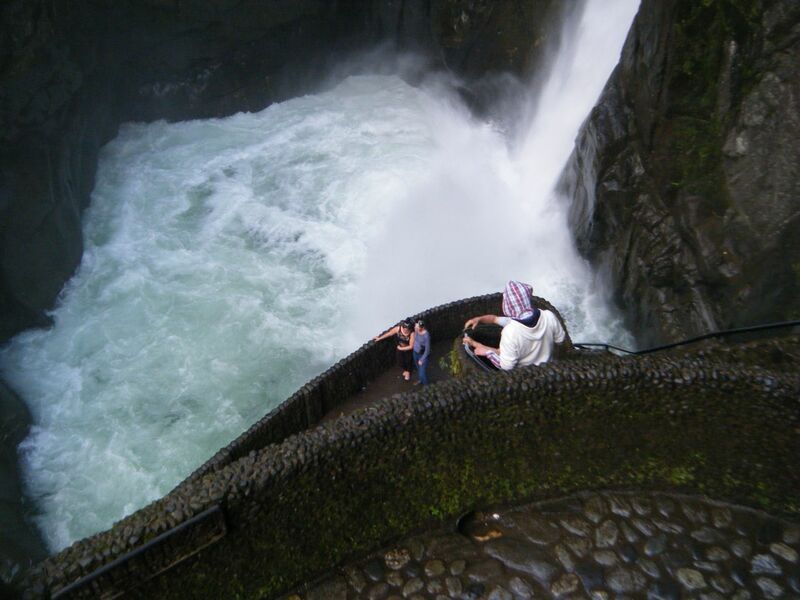 It's called Pailon del Diablo, which translates to Devil's Cauldron. The bottom really does look like a cauldron, too, as the waterfall has carved an almost perfectly circular hole in the hard rock and the water pouring into it really does look like it's boiling. This waterfall cannot be seen from the road. One has to walk down a path that has muchas steps. Thus, I stayed in the car with Isabel and Victoria. But I didn't mind. There were many, many things to look at, including tourists. We then went to our hotel, La Petite Auberge, and checked in. We've stayed at this hotel on each of our trips to Baños. It's really nice because it's low-key, has private gardens, and is inexpensive. It was after dark when we checked in and we were pretty hungry, but first we went to the office of Chebas Tours to make reservations for a tour the next day. Most of the tourism in Baños is on the weekend, so we didn't know how long the office would be open on a Sunday. Fortunately, it was still open. When that task was taken care of, we immediately went out to eat at The Swiss Bistro. We had seen this restaurant on previous trips but hadn't tried it yet. It was excellent. Gaby and Elvis left for Quito after we ate. The rest of us went to bed. The next morning, after breakfast, we met the bus for our tour. It was a double decker bus and, as we discovered on our last trip to Baños, they don't mind carrying me to the top deck. 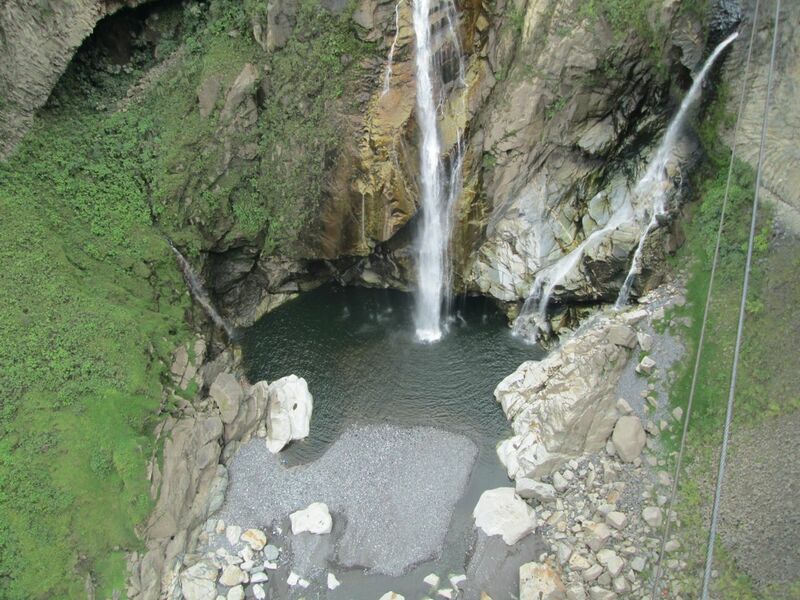 The tour goes to several different waterfalls and places where one can do activities such as zip-lining, suspended cable car riding, and bungee jumping. I only got down at one activity because, even though they were willing to help me, I didn't want to take advantage of the guide and driver. I was content with just being able to have such a great view while driving around. At the first stop, one can take the tarabita (suspended cable car) across the Pastaza River. 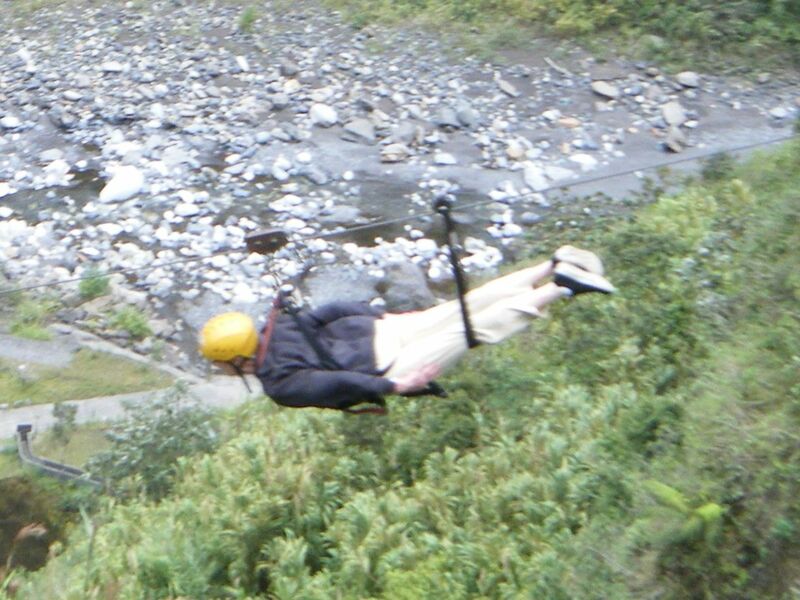 This is something I've done twice now because I like the thrill of being suspended above a raging river just as it enters a very narrow canyon. 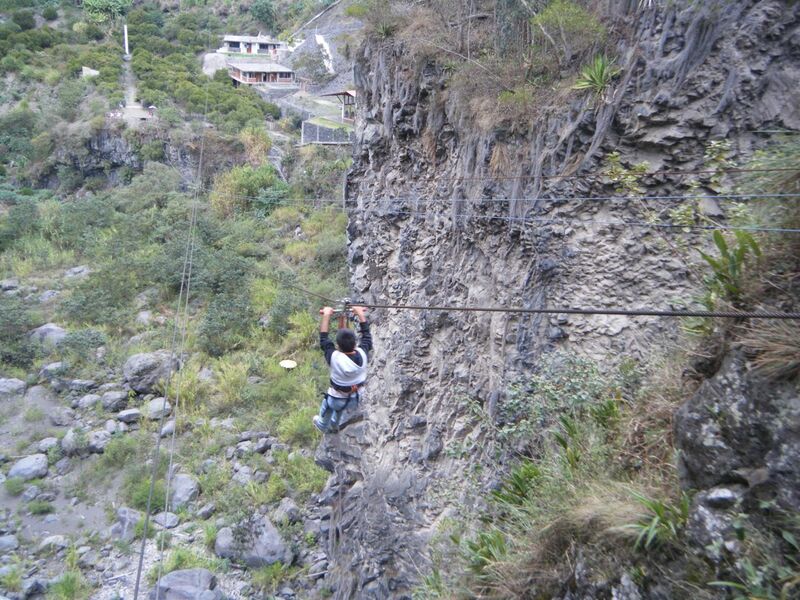 One either comes back across on the tarabita or zip-lines back across. I'm not sure if I'm strong enough anymore to do zip-lining (or if I would be allowed to do it) so I, like most people returned on the tarabita. 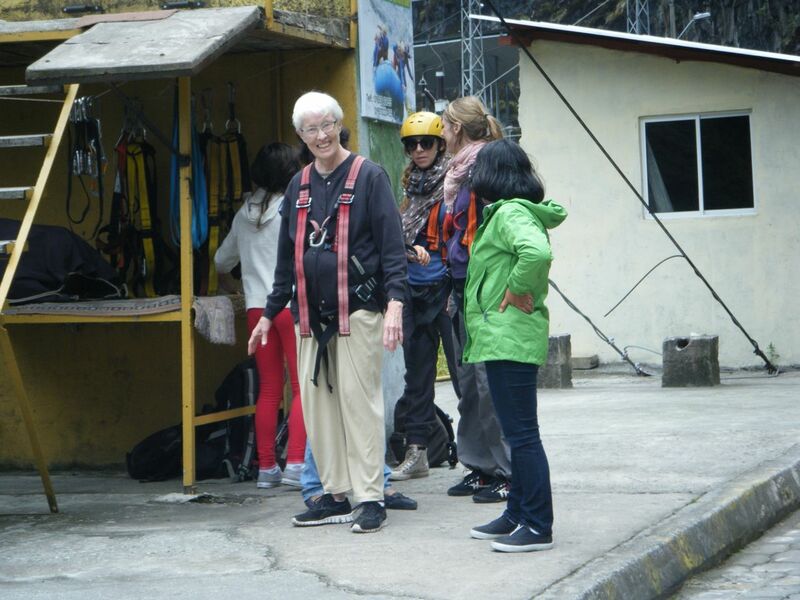 Pat had mentioned earlier in the week that zip-lining was on her "bucket list". 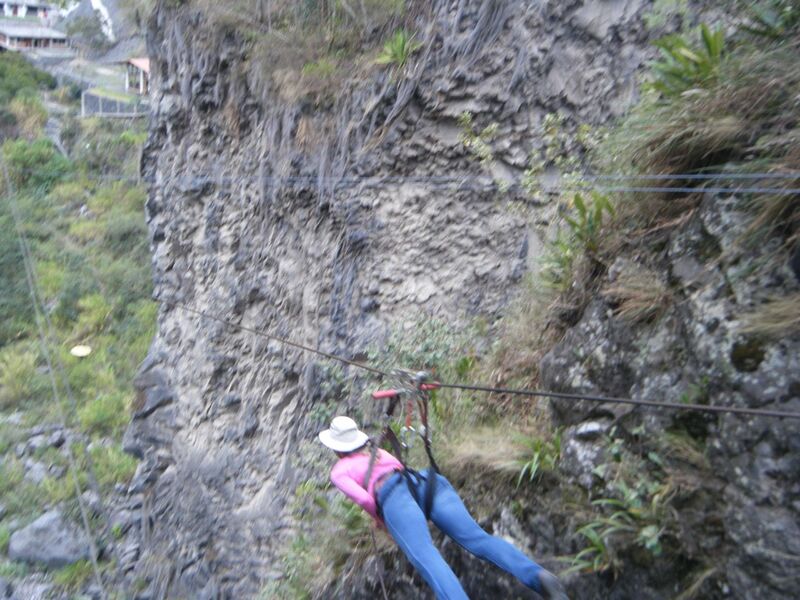 Now was her chance, but she decided to wait and see other zip-lines before taking the plunge, so to speak. However, she had inspired both Marilyn and Brayan to try it. Because there were no other people waiting for the tarabita, I got to stay on the other side of the river and watch the preparations of Marilyn and Brayan up close. 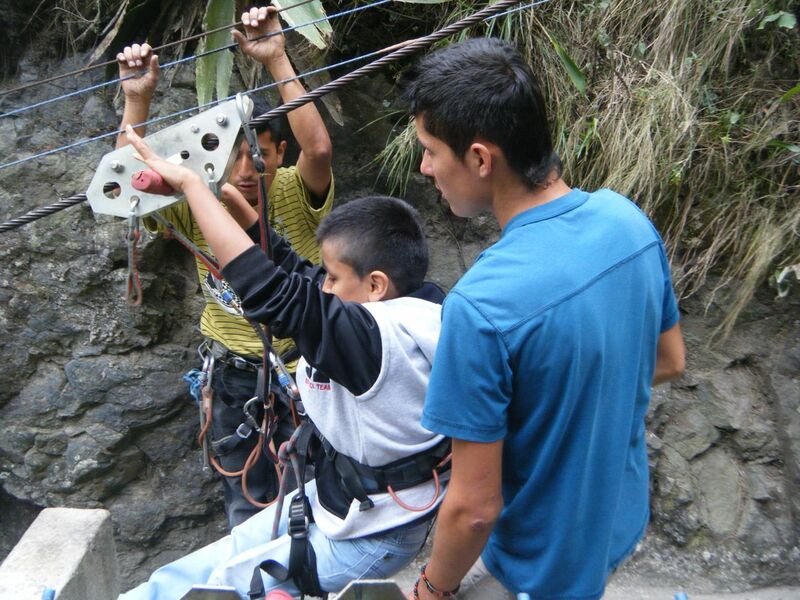 Marilyn chose to zip-line "Superwoman" style and Brayan chose the "sitting" style. I was really excited for them when they took off. I think I was vicariously going with them. Later, we came to a one kilometer zip-line along the Pastaza River. I'm pretty sure that I saw a sign advertising it as the longest in South America. This, declared Pat, was "bucket list" material. Even though I was on my high perch on the bus, I couldn't see anything after the first hundred meters or so. But Marilyn had the foresight to walk to a little promontory where she could see the whole thing. She got a great picture of Pat flying like an osprey looking for fish in the river. The rest of the tour seemed pretty tame after so much excitement. 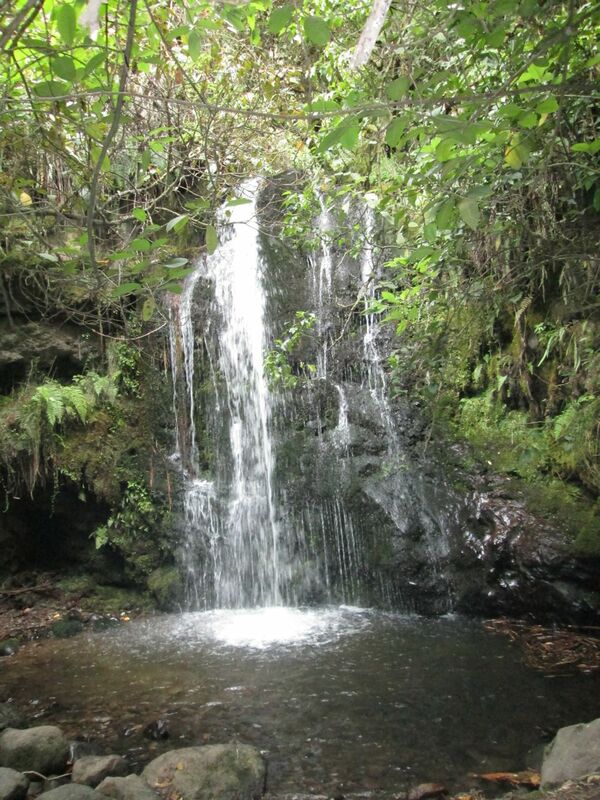 Nonetheless, the waterfalls were very beautiful. We went to Cascada Manta De La Novia, Cascada Agoyán, and El Pailon del Diablo (which we had been to the day before). On the tour we passed the Baños Zoo. So when we got back Brayan asked if we could go to the zoo. I knew it was inaccessible, so I opted to stay at Casa Hood, a kind of health food restaurant, and drink a beer or two. Marilyn left instructions with the waiter to refill my glass when needed and to give me another one if I asked for it. I asked for another one, of course. Casa Hood shows a movie every afternoon. I wasn't in that room, but I could hear it even though the door was closed because it was quiet in the room I was sitting in. If anyone had been looking at me when I figured out what the movie was, they would have wondered why I was smiling so broadly as I sat by myself. The movie was The Bucket List. 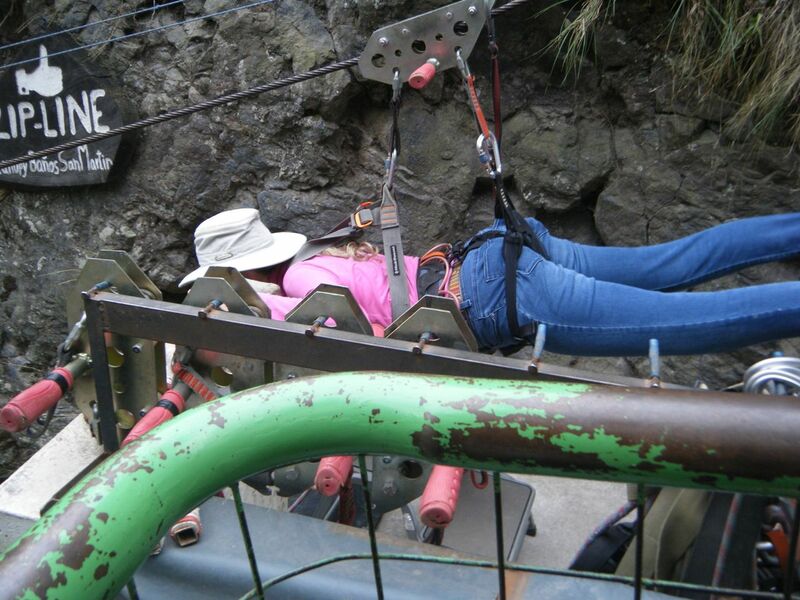 How appropriate after what Pat had said about crossing zip-lining off her bucket list. 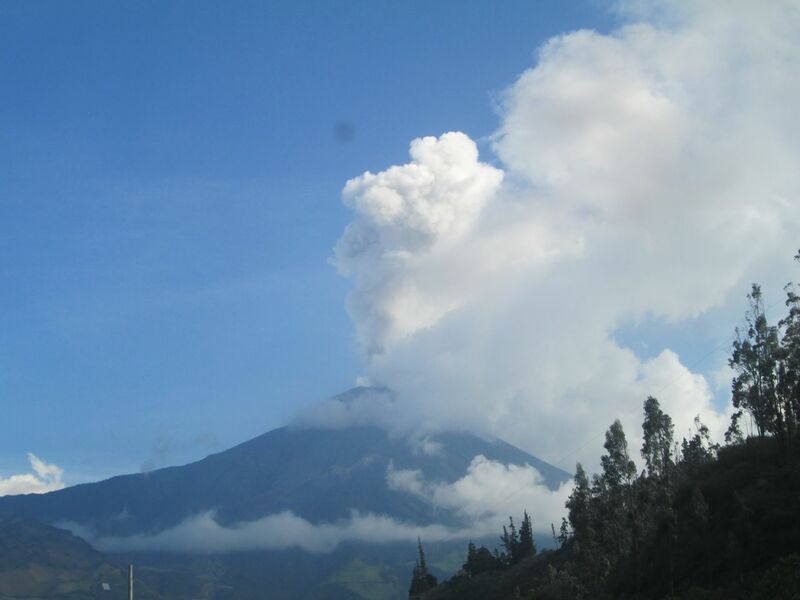 As I was sitting at my window table enjoying a view of the side of Tungurahua and people-watching, I heard BOOM! and felt the earth shake. No one ran out of the restaurant, so I figured I was okay and the volcano was only experiencing growing pains. Indeed, maybe it wasn't the volcano at all. Maybe they had had an accident in the kitchen with a propane tank or something. I had almost convinced myself of this alternate explanation when the rest of our group came back and, over dinner, asked me if I had heard or felt anything. I was delighted to have confirmation of Tungurahua having spoken. The next day we ate breakfast at the French restaurant on the hotel grounds. It is another good place to eat in Baños. It's the only place I've found in Ecuador that serves good French toast, so of course I ate that. 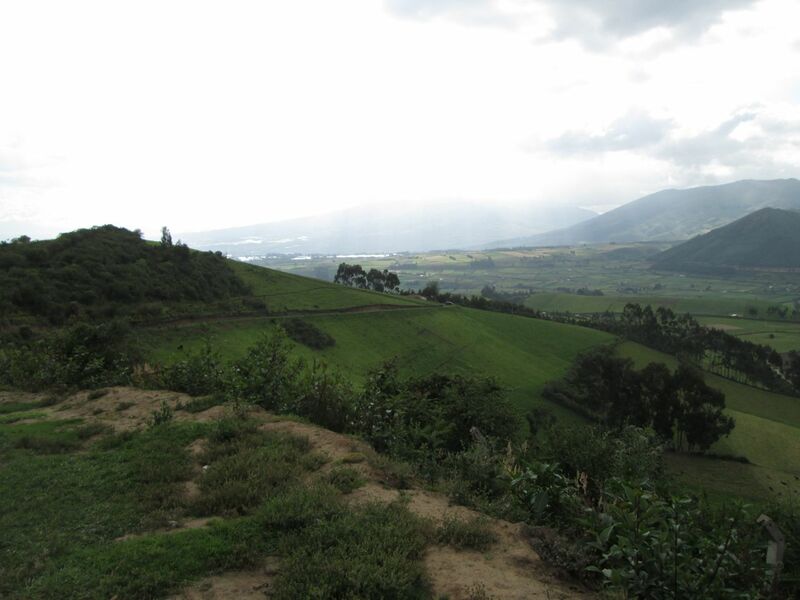 We then drove back to Otavalo. On Pat's last day here we took things easy. We only walked to Plaza de Ponchos to look for some small gifts. At about 9:00 pm we left for the two hour drive to the airport so Pat could be in time for her 1:00 am red-eye to Houston. Will Pat grace us with a third visit? Only time will tell, but some people say, "The third time's the charm." According to Pat, however, the first two times were pretty charming themselves.